Women's Super League One champions Manchester City will start their Spring Series campaign at home to 2016 runners-up Chelsea on Sunday, 23 April. Newly promoted Bristol City host Reading as they get the top-flight season under way on the previous day. Teams will play each other just once in a one-off, transitional competition before the WSL's switch to a winter calendar for 2017-18. For top-flight teams, the league runs over six weeks until Saturday, 3 June. The WSL 2 Spring Series starts on 11 February with a game between London Bees and Brighton, who are making their debut after promotion, and concludes on Sunday, 21 May. There will be no promotion or relegation at the end of the Spring Series, but trophies will be awarded to each division's winner. 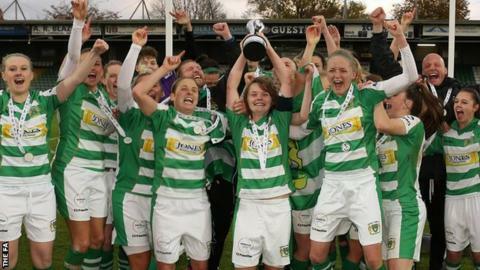 "It's set to be an exciting few months for the domestic women's game with clubs competing for this one-off trophy and the Women's FA Cup final in May," said FA director of football participation and development Kelly Simmons. "It's important that we keep building this momentum ahead of the Euros and for the return of the WSL in September."